O’er the field’s wide booty, and four heads in their plowing. Odin’s hall-shingles, the shrewd sea-farers. On the bench before thee. He saw three high-seats, each above the other, and three men sat thereon, one on each. And he asked what might be the name of those lords. 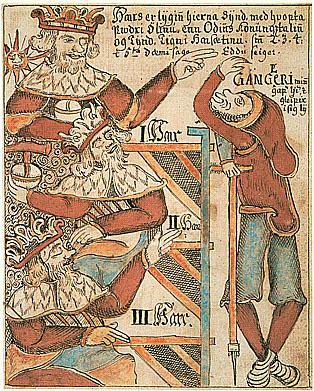 He who had conducted him in answered that the one who sat on the nethermost high-seat was a king, “and his name is Hárr; (1) but the next is named Jafnhárr; (2) and he who is uppermost is called Thridi.” (3) Then Hárr asked the newcomer whether his errand were more than for the meat and drink which were always at his command, as for every one there in the Hall of the High One. He answered that he first desired to learn whether there were any wise man there within. Hárr said, that he should not escape whole from thence unless he were wiser. On the left/index you can see who Gangleri is, a seeker, like us. In the menu above there are a few options to choose from. You can read a bit more about these pages (intro), or directly jump to one of the sections with articles or reviews. If you have sometime to say or ask, you can use the comment fields under the messages or Facebook or ask your question (just like Gangleri) to Harr, Jafnhar or Thridi (@Gangleri.nl).